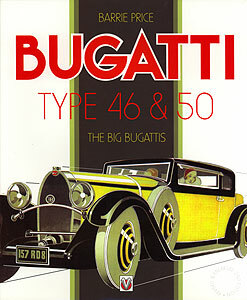 The Bugatti Type 46 was announced in the autumn of 1929. The new Bugatti chassis, at almost twelve feet in length and powered by an 8-cylinder engine of 5300cc, was intended to be the basis of a superlative large luxury car – and so it proved to be. Bodied by the greatest European coachbuilders to the highest standards of quality and style for rich and discerning clientele, the T46 was in many ways a smaller Royale and is said to have been the favourite of Ettore Bugatti. Later, an optional supercharger became available to create the 46S model. In 1930 the Bugatti Type 50 superseded the T46. The new model still used the T46’s chassis and most of its running gear, but featured a new, high-performance, twin-overhead-camshaft engine of just under 5-litre capacity. This supercharged unit gave the T50 very spirited performance for such a large and luxurious car, placing the model firmly in the Grand Sport category. 1931 saw a team of T50s take part in the Le Mans 24-Hour race, but the cars were withdrawn before the race finished after Rost’s car crashed, tragically killing a spectator in the process. In total, fewer than five hundred T46 and T50 Bugattis were built in but, with the obvious exception of the Royale, these cars represented the pinnacle of luxury car manufacture for the famous Molsheim marque. See fabulous coachbuilt bodies by Gaston Grummer, Chapron, Ghia, James Young, Van Vooren, Weymann, Billeter & Cartier, Gangloff, Joss Neuce, Mllion-Guiet, Freestone & Webb, Van den Plas, Arthur Mulliner, Kellner, Lancefield, Corsica, Visse et Haf, Ottin, Brainsby-Woollard, Sodomka, Graber, Weinburger, Abbots of Farnham as well as Bugatti’s standard bodies. Barrie Price’s work is a concise history of the Bugatti Types 46 and 50, an engineering analysis and the most thorough survey yet of the many coachbuilt bodies fitted to these famous chassis. Appendices include a complete chassis listing and reproductions of promotional material produced by Bugatti, Bugatti agents and others. “If I was asked to give my opinion as to the best all-round super-sports car … I should, without hesitation whatever, say it was the 3.3 [T57] Bugatti.” – Sir Malcolm Campbell, The Field, September 4th, 1937. 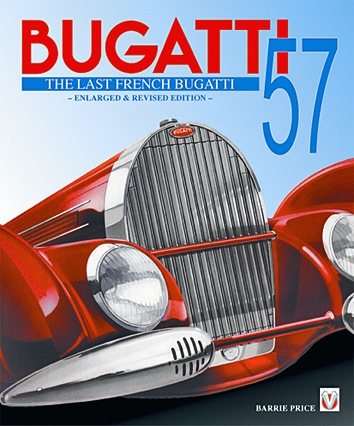 The magnificent Type 57 was the final flowering of the genius of Ettore Bugatti and Jean Bugatti, and was the last truly new model from the Bugatti factory in Molsheim, France. Conceived as a fast, luxurious and exclusive touring car, the T57 was in production from 1934 to 1939, and was so successful that the model accounts for around 10 per cent of all Bugattis built at Molsheim. Not only a sales success, the T57 formed the basis of a Grand Prix model, a twice Le Mans-winning sports racing car and, in road-going form, wore some of the most beautiful bodies ever created by the great coachbuilders of the vintage period. See the work of Letourneur & Marchand, Graber, Gangloff, James Young, Corsica, Van Vooren & Saoutchik, Vanden Plas, Figoni & Falaschi, Sodomka, Henri Labourdette, Fernandel & Darren, Franay, Guilloré, Malyby, Tüschner, Worblaufen and Rice & Harper. Also the standard bodies: Atalante, Galibier, Stelvio, Ventoux, Atlantic and Aravis. Barrie Price’s work is a concise history of the T57 and its derivatives the T59, T64 and T101, an engineering analysis, and the most thorough survey yet of the many coachbuilt bodies fitted to this famous chassis. The reader will also find appendices crammed with detailed and valuable information ranging from chassis numbers and original owners to sales and service statistics.